What has led to the recent revival of the extreme right in Western democracies such as France and Australia, and what impact has their success had on mainstream politics? What shift has taken place in recent times as ideas and groups that once were considered marginal and undemocratic have come to play an important part in mainstream politics? 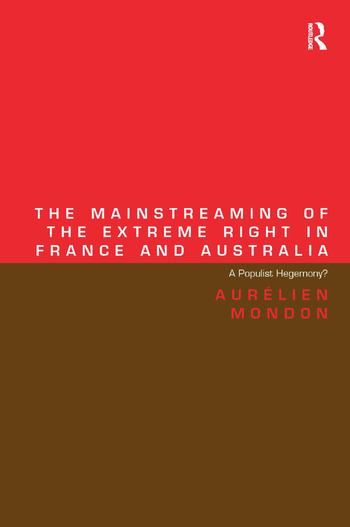 This book addresses these key questions by examining the resurgence of the extreme right in France and Australia and explores the history of right-wing groups and their relationship with and impact on mainstream politics. This compelling study on the rise of right-wing parties in two countries with different histories but similar experiences of how mainstream parties campaigned and reacted to the changing political landscape presents a fascinating comparison of the history and political impact of ethno-exclusivist and right-wing populist politics in liberal democracies. A detailed and thorough comparative analysis of parties such as the Front National and One Nation, and the mainstreaming of their discourse by prominent leaders like John Howard and Nicolas Sarkozy, offers new insights on the rise of the contemporary extreme right and how these groups and the ideas they represent have become increasingly mainstream, and perhaps even hegemonic in the current political state. Contents: Introduction; Part I The Contemporary Extreme Right: Definitions and Clarifications: Introduction to part I; Populist, radical or extreme? ; The over-arching extreme right category; A radical right within the extreme right; Conclusion to part I. Part II Right-Wing Populism as a Catalyst: Introduction to part II; The rise of the radical rights; Anomaly or deep malaise? ; The deep roots of the populist rebirth; Conclusion to part II. Part III The Populist Temptation in Government: Introduction to part III; The populist rhetorical shift; The populist use of history; A populist hegemony? ; Conclusion; Bibliography; Index. Aurélien Mondon is a Lecturer in French Studies at the University of Bath. His work focuses on the recent mainstreaming of the extreme right, and the impact of neo-racist and right-wing populist discourse on Liberal Democracies.